Dry at last – sunny. 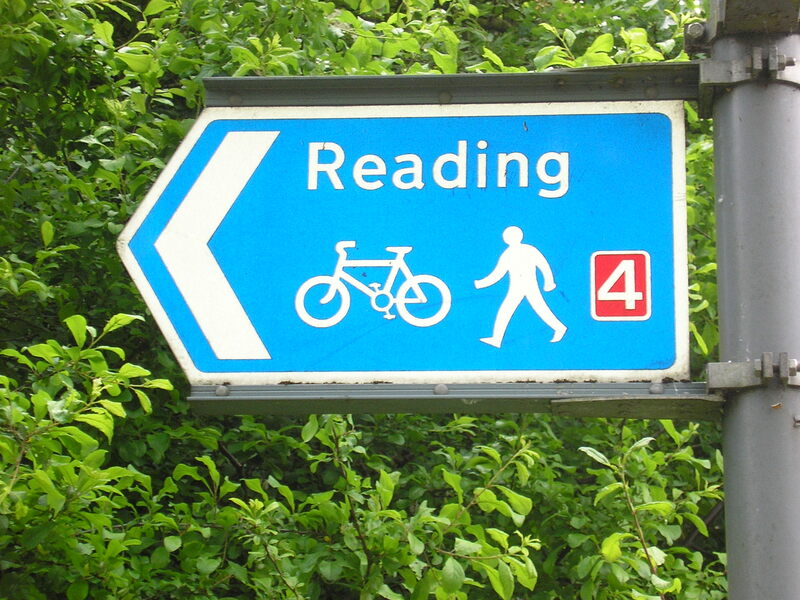 Good run on NCN4 out of Reading until the RIDICULOUS gate, where we had to unload and lift bikes over!! Nostalgic run along canal. Cuts the average speed and needs concentration on tow-path. Quite a few people about. Met another Surly. Good pub (still wish food snacks were cheaper) at Woolhampton. Interesting swing bridge. Mad run through Thatcham and Newbury back to canal towpath. Stopped at Tourist Office to check camping – nothing until the Wilcot area (too far) so booked into the “Three Swans” at Hungerford. Honeymoon suite? bikes in the shed. OK but on main street with a clockbell opposite, could be noisy? Meal in hotel after failing to find community-run pub – tried to keep price down but very difficult. Forecast making camping more likely. Little shopping on sunny morning and left Hungerford on undulating, leafy, twisty roads, stopped in Great Bedwyn – interesting little village for cakes and stamps (Post Office store covered in epitaphs?) Lunch halt at Royal Oak, Wootton Rivers – rather pretentious pub after looking promising – too much diversity – met interested cyclists (Red Kite Productions). Next stop Devizes Bike shop for brake shoes and new gloves for me. 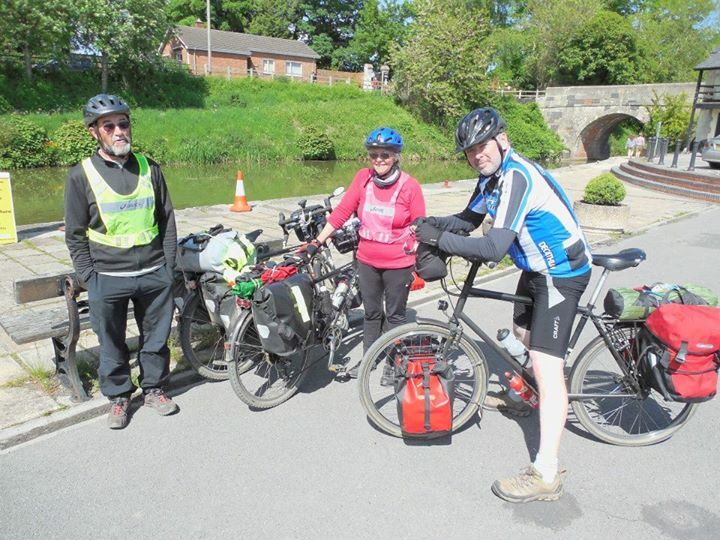 Met Somerset Levellers – cyclists and Air Ambulance men. Booked into Lower Foxhanger Camping Site. 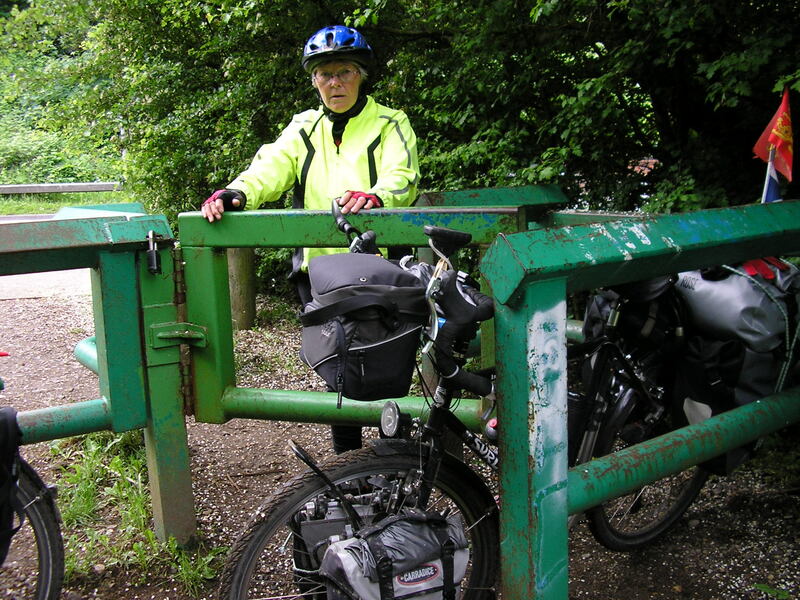 Followed canal down Caen Hill locks to site (£10) Used Ortleib and back rack as cooking stand. Making up for expensive hotels…? Dry sunny morning. Finally packed up and off by 10a.m. My shoulder was giving a niggle. Towpath all the way to Bath, very busy; bikes, pedestrians and loads of boats. Surfaces pretty good; but again needs great concentration. Boatman’s breakfast (massive) at Bradford on Avon (bike shop opposite) Sadly couldn’t pick out Rose Cottage at Claverton. Bath very busy – a carnival (Coronation anniversary perhaps?) Sat on the “Peter John Wells” bench for a break at Bathhampton. Followed signs on to Bath/Bristol rail link (NCN4) – good surface, Sustrans reps at Bath end. Turned onto NCN(4)10 at Saltford. I was feeling a bit drained ; heat and shoulder. Camped at Buryview Farm (£14), a bit off route. Great pub “Wheatsheaf” short walk away, very busy with live music, on A368. 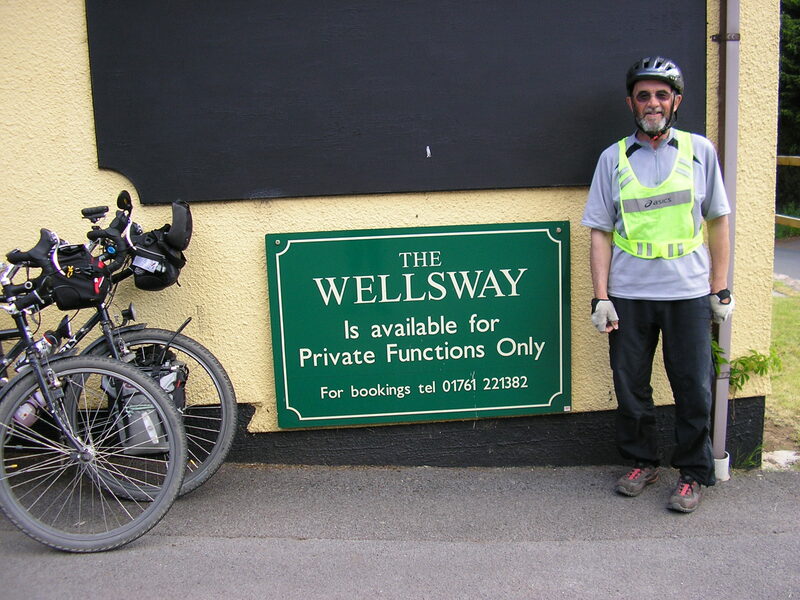 at Wellsway Pub., Harptree – good one signed to rejoin OS route at Down Farm on B3271. Very steep downhills (hot brakes). Lunch in “Victoria” at Priddy. 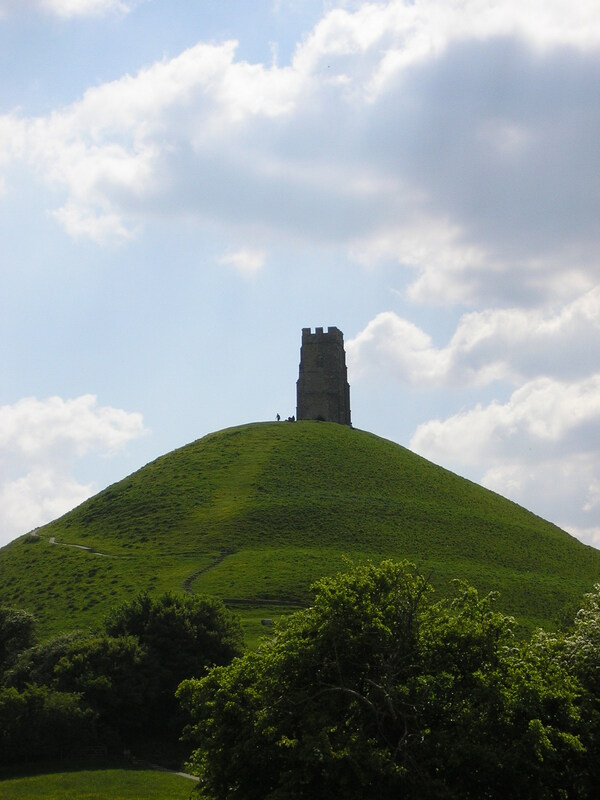 Bit of an odd route through Wells and on to Glastonbury – decided needed B and B tonight, climbed to The Tor and into the town. Found Magdelene House (£80) bit over the top but very well-meaning, bikes in conservatory. WiFi so can catch up postings. Now on NCN3. potato cakes! A great ride across the Levels through peat bogs. Supplies at Chilton Polden, good run through the villages to Bawdrip and via railway, canal and roads to Bridgewater – over an easy bridge to cut of 3kms of route (not really cheating!) and lunch at the Boat and Anchor – more expensive sandwiches. 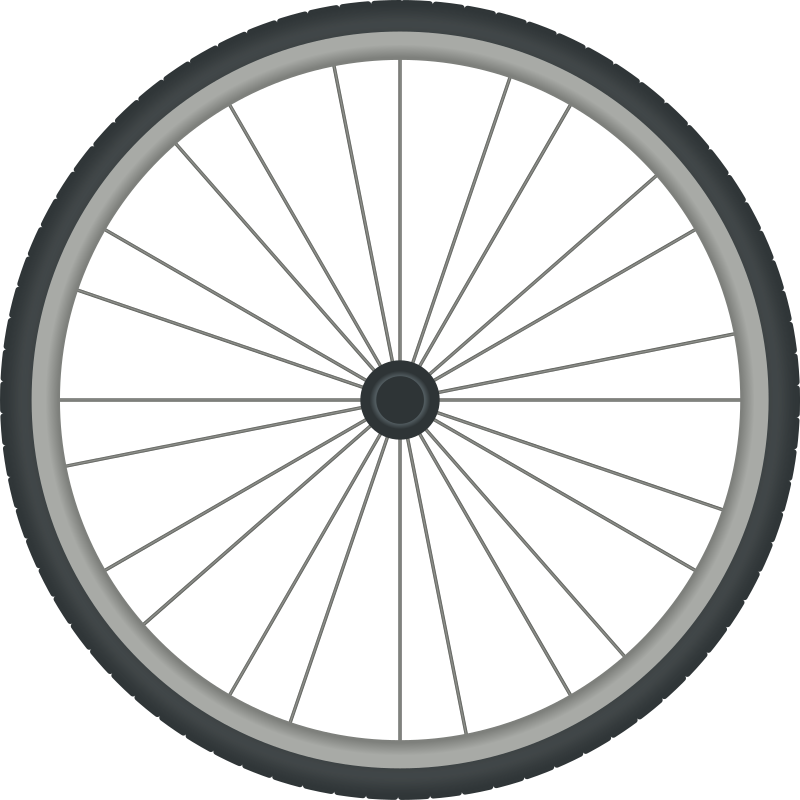 Good chat with cyclists – ex-police, say going to cycle Caen to Bordeaux. Long run down Bridgwwater-Taunton Canal – good track into Taunton. Excellent ice-cream from van in middle of Taunton and “fought “our way through the school turnout having decided to make the campsite at Greenham – Gamlins Farm. Nice site with a games room – sadly WiFi didn’t work in it! Tomorrow looks hillier and should lead to Exmoor. Left camp 9ish, nights still chilly despite wearing the thermals! Into the steep ups and downs – did a good bit of walking (Me that is) Still fair bit of traffic even on the narrow lanes – Nice little bakers and teashop – coffee, cake and provisions at Bampton. More up-down-up slog to Dulverton, we knew there were very, very steep hills out of the village. Had a picnic lunch stop (I fell asleep on bench while Gerry went shopping (Loos cost 20p here!) We were absolutely right – v.v.v. steep out to Exmoor, then more like Scotland – saw first Exmoor ponies (much skittier than other animals we’d seen!) and arrived at Sportsman’s Inn (Landmark PH on OS map). Bikes in the Function Room – landlord called “Martin”. Good bar meal – busy with WI outing!